Applicable: Bathroom, toilet, living room, under the table, bedroom, kitchen, car seat, and so on. Flannel material is very comfortable to touch, safe and non-toxic, dust proof and water absorb, high quality, practical and durable in use. Cute cartoon sea ocean fish, shell and animals pattern, very beautiful and cute, it will be a great decoration for your house. Bottom designed with anti-skid PVC latex foam net, this mat will not easily skid when you step on it, protect you in the wet slippery bathroom. 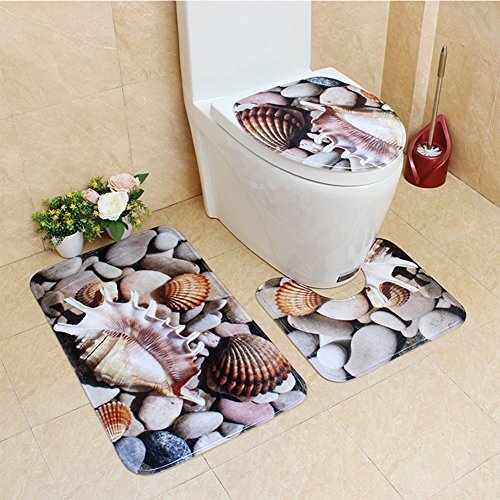 Breathable anti-skid floor mat set, dust-proof and easy to clean, it is suitable for your bathroom, living room, room entrance, bedroom and so on. If you have any questions about this product by Alician, contact us by completing and submitting the form below. If you are looking for a specif part number, please include it with your message. wizardry1986 This House Is Full Of Crazy People And Animals You've Been Warned Funny Floor Mat With Non-Slip Backing Novelty Bath Mat Rug Excellent Home Decor 16" × 24"